Diaphragmatic eventration is an abnormally elevated hemidiaphragm in the chest cavity with poorly developed muscle fibers. This condition can lead to abnormal displacement of intra-abdominal organs. It is a developmental anomaly and usually remains asymptomatic in early life. It presents later with respiratory and occasionally gastrointestinal complications. A clinical scenario of eventration of diaphragm, displacement of the stomach, the splenic flexure of colon, and the spleen with gastric volvulus is uncommon. Early diagnosis and prompt intervention prevents development of necrosis and perforation of stomach. 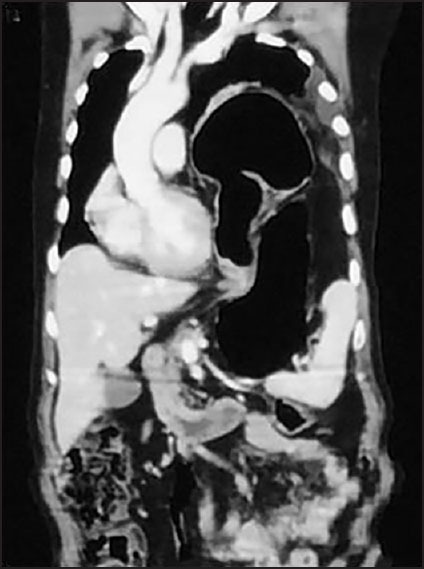 We report a case of a 68-year-old male having left sided diaphragmatic eventration associated with acute on chronic intermittent organoaxial gastric volvulus and displaced intra-abdominal organs. He underwent surgical repair with a successful outcome. Diaphragmatic eventration is an abnormally elevated dome of the diaphragm with poorly developed muscle fibers. This is usually congenital in nature due to incomplete muscularization of diaphragm. It may be acquired due to phrenic nerve injury. Intra-abdominal organs become displaced in this condition, the most common being the stomach. Abnormal displacement of the stomach may lead to volvulus and further complications. Gastric volvulus is an abnormal rotation of the stomach usually by more than 180 degrees causing a closed loop obstruction. It usually presents with nonspecific upper abdominal pain, retching, and vomiting. Gastric volvulus can lead to incarceration, strangulation, and perforation if untreated. Torsion may occur along the long axis of the stomach (organoaxial gastric volvulus) or along the perpendicular axis (mesentroaxial gastric volvulus). We present the management of a 68-year-old male who presented with left diaphragmatic eventration and organoaxial gastric volvulus. A 68-year-old male presented with complaints of pain in left upper quadrant of abdomen with fullness, projectile vomiting, and constipation for 2 days. The vomitus contained recently ingested food. He had shortness of breath which increases on lying down on the right lateral position. He had similar complaints intermittently over the past 1.5 years, which were relieved after vomiting. On clinical examination, he was found to be tachypneic with tachycardia and moderate dehydration. Fullness was seen in the epigastrium. There was minimal tenderness over the left hypochondrium with no palpable lumps. Air entry was decreased in the left hemithorax with presence of gurgling sounds on auscultation. A clinical diagnosis of left diaphragmatic hernia was made. He was resuscitated with intravenous (IV) fluids and a nasogastric tube was placed for gastric decompression. His hemoglobin, white cell count, electrolytes, and renal function tests were within normal limits. 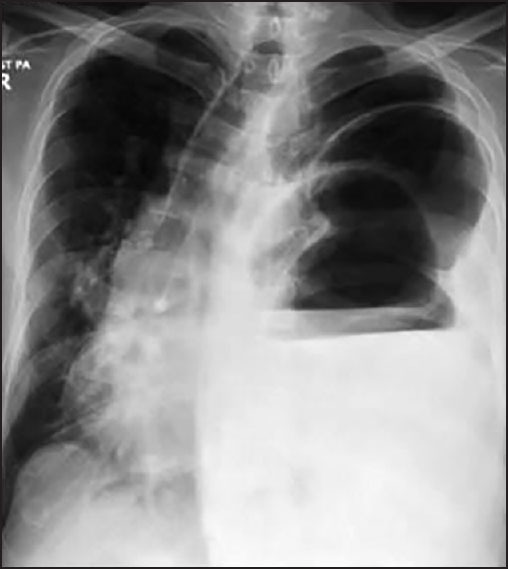 His chest radiograph showed a raised left diaphragmatic dome with a gastric shadow obliterating the left lung field and mediastinal shift to the right [Figure 1]. 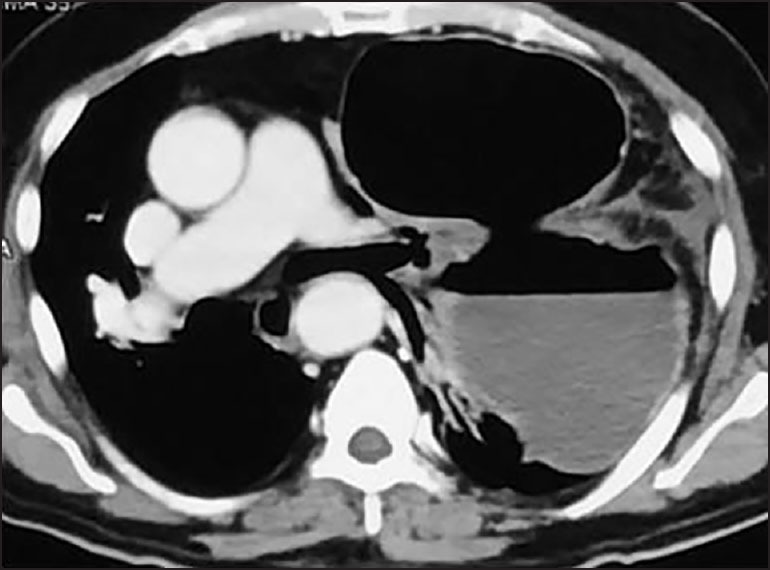 Contrast-enhanced computed tomography (CT) of the chest and the abdominopelvis showed a collapsed left lung, a left diaphragmatic hernia with the stomach, splenic flexure of the colon, and the spleen as contents with a gastric volvulus [Figure 2] and [Figure 3]. After adequate resuscitation and informed consent, he was taken for laparotomy. Intraoperatively, thoracic displacement of intra-abdominal organs was seen. There was diaphragmatic eventration with the stomach, the splenic flexure, and the spleen in the left hemithorax [Figure 4]. An organoaxial gastric volvulus with a constricting ring along the longitudinal axis was seen [Figure 5]. Adhesions were released, the contents reduced, and viability of the stomach was confirmed. Diaphragmatic plication with anterior gastropexy was done. Postoperatively, he made a satisfactory recovery. The chest drain was removed on the third postoperative day [Figure 6]. He was discharged home on the 6 th postoperative day. His symptoms resolved completely and was doing well on follow-up after 6 months. Eventration of the diaphragm can be congenital or acquired. Congenital eventration of diaphragm is an abnormal elevation of one leaf of intact diaphragm characterized by a developmental abnormality of the diaphragm musculature. Eventration can be unilateral or bilateral. The left side is affected more often than the right, and males are affected more often than females. The affected diaphragm may consist of a fascial layer with few or no muscle fibers. Phrenic nerve is normal in all congenital cases. Acquired diaphragmatic eventration is seen in phrenic nerve injury. 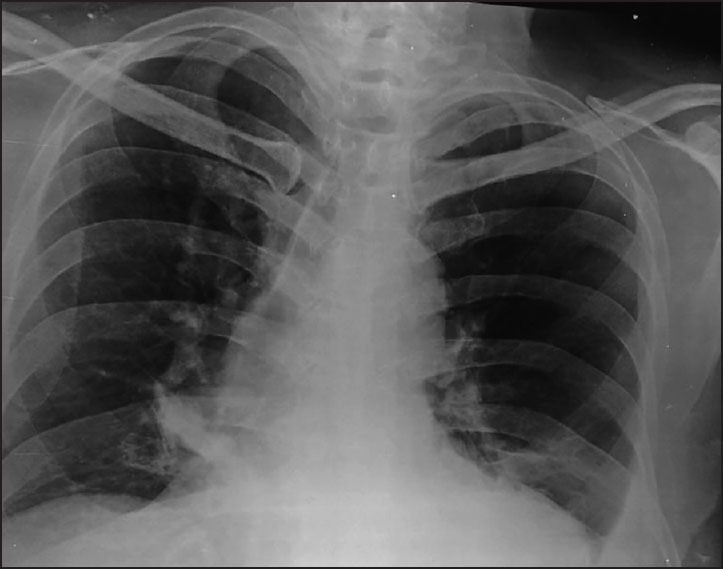 In addition, other pointers like a gas-filled viscous in the lower chest shown by chest radiography and obstruction at the site of volvulus shown by emergency upper gastrointestinal series should be kept in mind. Sometimes subtle signs like hiccups  or hearing of gurgling sounds both by patients and physician combined with decreased air entry in the chest, as was in the present case, can be pointers for herniation. Most patients with unilateral diaphragmatic eventration are often asymptomatic; however, some complain of dyspnea on effort or orthopnea, due to the decrease in ventilation and oxygenation because of paradoxical motion of the affected diaphragm and diminished intrathoracic volume. Management of diaphragmatic eventration varies greatly depending on whether the diagnosis is made in infants or adults. Asymptomatic patients with diaphragmatic eventration may be managed conservatively. Simple cases of diaphragmatic eventration may not require surgical intervention if it is not intruding significantly into the thoracic cavity and is not associated with adverse symptoms. However, treatment by plication is indicated if there are symptoms of dyspnea, recurrent pneumonia, chronic bronchitis, chest pain, poor exercise tolerance, and functional disorders of stomach. Symptomatic gastric volvulus associated with diaphragmatic eventration is a surgical emergency and always requires surgical repair. The surgical approach may be open, laparoscopic, or thoracoscopic; and plication with or without reinforcement by mesh. In our case an abdominal approach was preferred keeping in view the possibility of chronic and dense adhesions between the displaced viscera and the diaphragm. 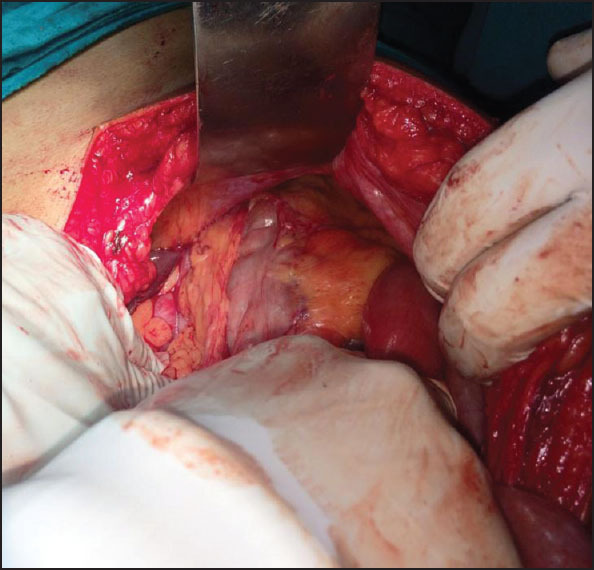 Abdominal approach in this case facilitated the safe reduction of the thoracic contents back into the abdomen. Recently, endoscopic reduction of the gastric volvulus,  percutaneous endoscopic gastropexy,  and laparoscopic gastropexy , for a gastric volvulus have been reported. Symptomatic gastric volvulus associated with diaphragmatic eventration is an uncommon condition. This combination is usually a surgical emergency. The acute presentation of gastric volvulus is dramatic and usually not difficult to diagnose. The subacute or chronic types, however, are frequently not recognized early in their presentation because they are accompanied by vague and nonspecific symptomatology suggestive of other abdominal processes. Early diagnosis by clinical suspicion and appropriate imaging combined with prompt surgical management is the key to prevent life-threatening complications. Skandalakis JE, Celborn GL, Weidman TA, Foster RS Jr. Skandalakis′ Surgical Anatomy: The Embryologic and Anatomic Basis of Modern Surgery. Athens: Paschalidis Med Public; 2004. p. 364-5. Shafiq S, Ramathilakam B. Eventration of diaphragm with a rare association. J Dig Endosc 2014;5:30-2. Townsend CM, Beauchamp RD, Evers BM, Mattox KL. Sabiston text book of surgery. The biological basis of modern surgical practices. 19 th ed. Philadelphia: Elsevier; 2012. p. 1223. Sinwar PD. 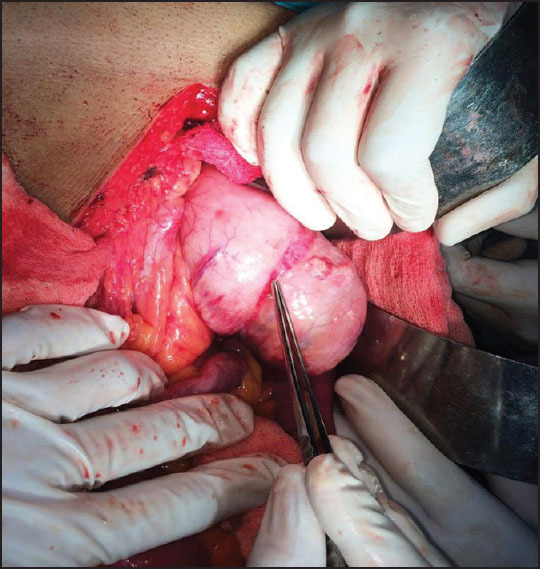 Gastric mesentroaxial volvulus with partial eventration of left hemidiaphragm: A rare case report. Int J Surg Case Rep 2015;9:51-3. McElreath DP, Olden KW, Aduli F. Hiccups: A subtle sign in the clinical diagnosis of gastric volvulus and a review of the literature. Dig Dis Sci Nov 2008;53:3033-6. Dogan NO, Aksel G, Demircan A, Keles A, Bildik F. Gastric volvulus due to diaphragmatic eventration and paraesophageal hernia. Turk J Med Sci 2010;40:825-8. Tsang TK, Walker R, Yu DJ. Endoscopic reduction of gastric volvulus: The alpha-loop manoeuvre. Gastrointest Endosc 1995;42:244-8. Baudet JS, Armengol-Mio JR, Medina C, Accarino AM, Vilaseca J, Malagelada JR. Percutaneous endoscopic gastrostomy as atreatment for chronic gastric volvulus. Endoscopy 1997;29:147-8. Beqiri A, Vanderkolk WE, Scheeres D. Combined endoscopic and laparoscopic management of chronic gastric volvulus. Gastrointest Endosc 1997;46:450-2. Schaefer DC, Nikoomenesh P, Moore C. Gastric volvulus: An old disease process with some new twists. Gastroenterologist 1997;5:41-5.